While most filmmakers and professional storyboard artists these days use software such as FrameForge or StoryBoard Artist to pre-visualize shot setups and camera moves, the basic principles behind effective storyboarding apply across all digital tools. To get to the heart of storyboarding fundamentals, Videomaker magazine has published a free report on the subject. 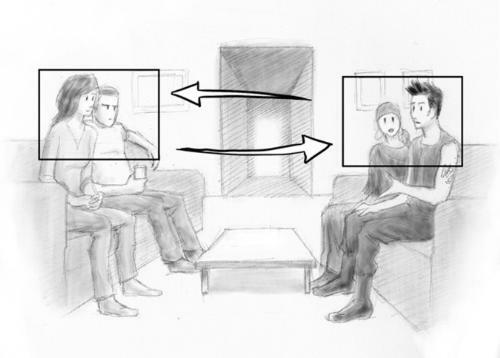 The guide was written by working storyboard artist Jennifer Albright, who explains in layman’s terms the differences between shot types, how to indicate camera and actor movement, and how to keep to one side of the 180-degree line when storyboarding. Albright, an L.A.-based illustrator whose clients include Fox Sports Marketing, says you don’t need to be a Pixar-level illustrator to make great storyboards: “Even simple stick figures can give people a good idea of what your shot sequence will look like,” she writes. More important is that the shots be clear enough to be read and understood by your director of photography or lighting designer. With the electronic storyboarding applications available today, once filmmakers are farther along in the preproduction process they are able to set lights and camera positions with the click of a mouse, with full tilting and panning capabilities. They can even set focal length limitations for specific lenses, and designate ceiling heights and other room dimensions to match the physical limitations on set. For a limited time, Showbiz Store is offering FrameForge Previz Studio 3 Core for the special catalog price of $319.95 with Coupon Code CAT1104FF. This entry was posted in Advertising, Commercials, Film and tagged FrameForge, Jennifer Albright, storyboard, storyboarding guide. Bookmark the permalink.